Devastated by the loss of four sons to tuberculosis and his wife in childbirth, a Philadelphia patriarch sends his three living children west in 1883 to make a new life in the clean mountain air of Colorado Springs. Odessa is struggling to survive consumption; Moira is beautiful and dangerously headstrong; and pugnacious Dominic is charged with establishing a new arm of the family business-a business he doesn't want. Readers will love The Homeward Trilogy, in which the St. Clair siblings struggle to follow where the heavenly Father leads them. In Breathe, Odessa arrives at a famous sanitarium seeking a cure for the disease that killed her brothers. While Moira and Nic establish themselves in Colorado Springs society, Odessa inches her way back to health . . . and into love with a soft-spoken fellow patient, rancher Bryce McAllan. When she witnesses a murder-in the very hospital where she is recuperating-and other patients begin to die, Odessa struggles to breathe again. She'd always expected to die young, but now that she has a reason to live, can she hold on to her fragile health to solve the mystery? I fell in love with the River of Time series by Lisa Bergren, from there I moved on to The Grand Tour series. Both were fantastic and contained a lot of historical detail with fantastic characters. I knew from those two series I wanted to read more by Lisa Bergren. I looked around and found Breathe. When I saw that it was set in Colorado and in one of the few places that I have visited, Colorado Springs, I had to read it. I was not disappointed in my selection. 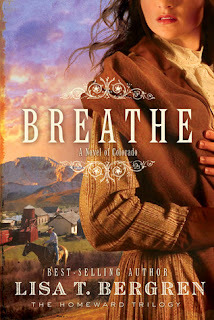 As I made my way through Breathe, the attention to detail brought back my trips to Colorado and to the beautiful scenery that there is in the state. It also brought back the memories of my trip to the Garden of the Gods. It was fantastic to read about Odessa and her family visiting there. I could see them there as the story unfolded. From the first chapter, Breathe catches your attention as Nic and Moria are doing their best to keep their sister well enough on the train to get her to a sanatorium in Colorado to help her get well and fight the consumption she has been battling for a couple of years. Nic and Moria don't want to see their sister suffer and die as their younger brothers or mother had. It is a race against the clock for the siblings. Once there, it's an up hill battle for Odessa, but it is made easier for her with the friends she makes in Sam O'Tool and Bryce McAllan. Her friendship with Sam is short lived however, when he dies suddenly at the sanitarium. Everyone says it was consumption, but Odessa wonders if her fevered dreams weren't something else entirely, but her hearing him being murdered in his room. As Odessa heals, she is drawn further in to a mystery that take a lot of her strength and new found health to solve. The story doesn't just focus on Odessa, but also her brother Dominic or Nic, and her sister Moria. The family interaction between the siblings is very touching. They care about each other, they also care about pursuing their own dreams. Nic cares about his sisters and is determined to make sure they are safe, which typically means he wants to use his fists to see it happen. Moria is determined to enjoy the finer things in life and have fun singing. But having such an independent mind for Moria and hot head for Dominic lead them to the sheriff of The Springs and puts the family in a precarious spot. It was an enjoyable read! I wasn't able to sit down and read the book for long periods of time with so much going on, but each time I picked the book up, I was able to get right back in.